Shimano’s electronic Di2 drivetrains will soon be able to communicate wirelessly with external devices, utilizing a small ANT-protocol transmitter that sits in-line with the current e-tube wiring. The company informally unveiled the new device at its European headquarters on Tuesday, along with a compatible computer from its component brand, Pro. Official information is scarce, pending an official release next month, but a quick run through the functions of the compatible cycling computer reveal the ability to display current gear selection and battery levels. A similar device, shown at Interbike this year, hid the ANT transmitter inside a Di2 shifter. 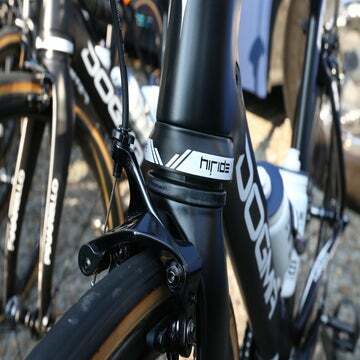 The version on display this week places the transmitter inside a small black box, which can be connected anywhere within Shimano’s e-tube wiring system. The display model was plugged in between the rear derailleur and the battery, mounted to the right seat stay. It could easily be mounted near the junction box or battery, and hidden inside the frame. However, Shimano representatives warned that hiding the box in such a way could weaken the signal beyond usability. At least at first, the device will only be able to send its information to the Pro SCIO head unit, another new-for-2014 product. Shimano would not confirm that the device will use the open ANT+ protocol, allowing the data to be sent to any ANT+ head unit, such as a Garmin. The device cannot be used to control shifting, at least for now. If Shimano plans to use the device to allow comprehensive wireless access to its Di2 system, simplifying the process of defining things like shift button function and shift speed that can currently only be adjusted by plugging the system into a computer with Shimano’s software, this development could be just the very tip of a rather exciting iceberg. But if the wireless functions stop here, with the basic gear selection and battery level functions visible on the SCIO, the development is far less impressive. Let’s hope for the former, not the latter.